Clinical recommendations discouraging the use of CYP2D6 gene testing to guide tamoxifen therapy in breast cancer patients are based on studies with flawed methodology and should be reconsidered, according to the results of a Mayo Clinic study published in the Journal of the National Cancer Institute. For years, controversy has surrounded the CYP2D6 gene test for breast cancer. Women with certain inherited genetic deficiencies in the CYP2D6 gene metabolize tamoxifen less efficiently, and thus have lower levels of tamoxifen’s active cancer-fighting metabolite endoxifen. Numerous studies have shown that these women gain less benefit from tamoxifen therapy and have higher rates of recurrence. However, two large clinical trials found no link between the CYP2D6 genotype and tamoxifen effectiveness, prompting recommendations against testing. In the new Mayo Clinic study, researchers found that previous studies, which used tumor tissue instead of healthy tissue to determine the CYP2D6 genotype, were prone to error. The study found that up to 45 percent of breast tumors exhibit genetic alterations affecting the CYP2D6 gene. 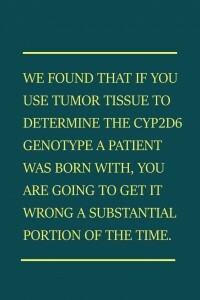 Thus, the use of tumor tissue to obtain DNA leads to a distortion of the patient’s true or inherited CYP2D6 genotype. CYP2D6, which stands for Cytochrome P450 2D6, is one of the most important enzymes involved in drug metabolism. It is responsible for the breakdown of nearly a quarter of all medicines prescribed. The CYP2D6 gene is highly variable. That variability is the main genetic factor affecting how the liver metabolizes tamoxifen, and the blood levels of the important metabolite endoxifen. Most individuals carry two copies or alleles of the CYP2D6 gene, one inherited from each parent. However, Dr. Goetz and his colleagues identified that up to 45 percent of breast tumors lose one of these “parental” CYP2D6 alleles, a phenomenon known as loss of heterozygosity. Use of tumor DNA to derive CYP2D6 genotype resulted in a distortion of the inherited CYP2D6 genotype and the inability to predict the concentrations of endoxifen. To explore whether use of tumor tissue to obtain DNA could result in CYP2D6 genotyping errors, the researchers first looked for loss of heterozygosity at the CYP2D6 locus in genomic tumor data from two large breast cancer datasets, the Cancer Genome Atlas and Foundation Medicine. They found loss of heterozygosity in over 40 percent of the breast tumors analyzed. These findings suggested that genotyping techniques using DNA extracted from tumor samples could misclassify a patient’s CYP2D6 genotype. Next, the researchers sought to directly compare CYP2D6 genotypes derived from patients who provided normal and tumor tissue. Using samples from patients enrolled in the NCCTG 89-30-52 tamoxifen trial, the researchers showed that there was perfect agreement between CYP2D6 genotypes derived from non-malignant tissue and those derived from cheek swabs. 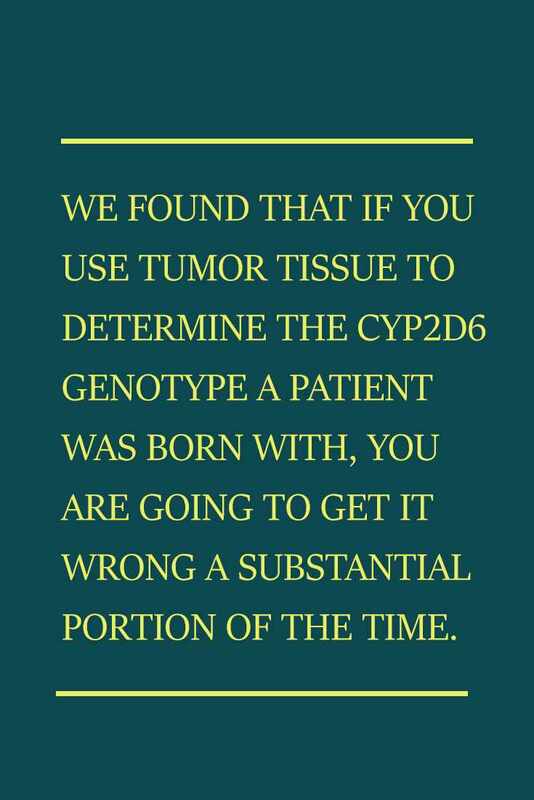 In contrast, 20 percent of the CYP2D6 genotypes were misclassified when tumor tissue was used. The researchers say their results should prompt a careful reassessment of the data necessary to inform patients and clinicians properly about the value of CYP2D6 testing. Co-authors from Mayo Clinic include Vera Suman, Ph.D., Stephanie Safgren, Mary Kuffel, Matthew Ames, Ph.D., and Krishna Kalari, Ph.D. The study was funded by the National Institutes of Health, the Mayo Clinic Breast Cancer Specialized Program of Research Excellence (SPORE), and the Breast Cancer Research Foundation.